1st iPod with a 'proper' click wheel and launched July 2004. 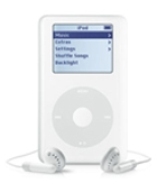 All standard versions came in white and were supplied in 20GB or 40Gb versions. Apple launched a special verision of the 4th Gen called the U2 Special Edition - these can also be repaired by iPod Surgery.